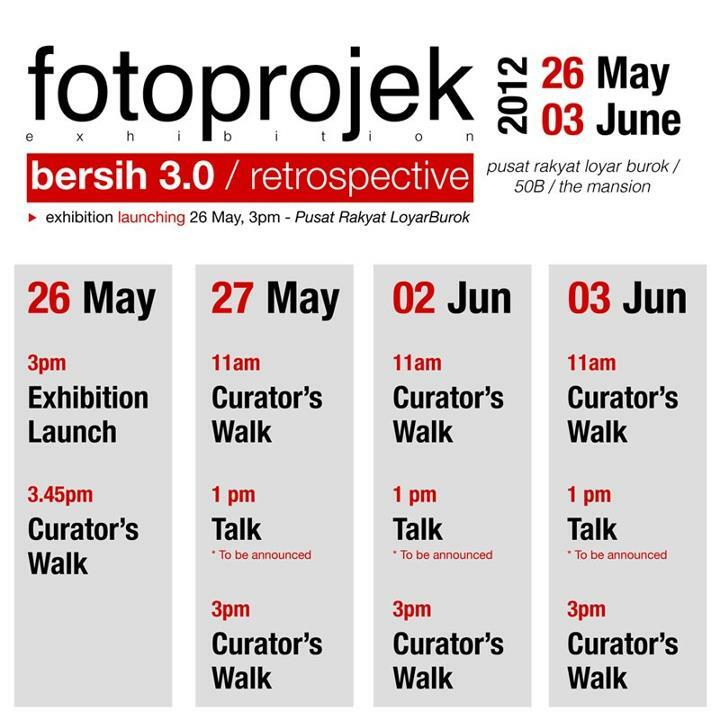 Who: Malaysian contributors from around the world, curated by a panel organized by Fotoprojek. How Much: Free, I guess? 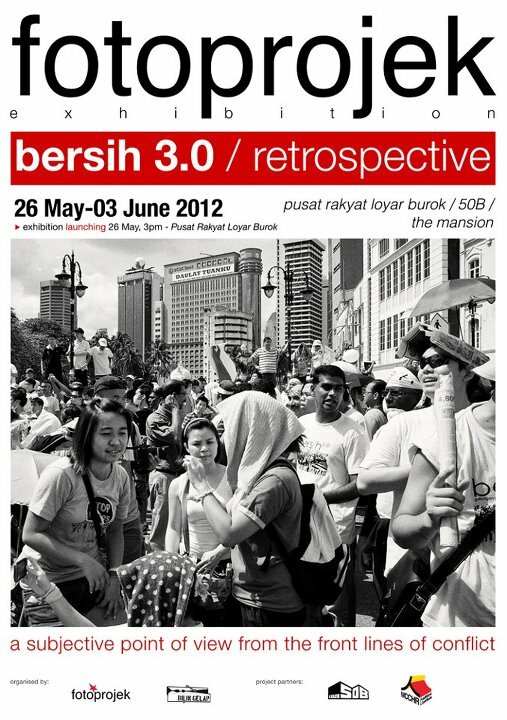 “FOTOPROJEK : BERSIH 3.0 / RETROSPECTIVE is a chronicle of the April 28th event as seen through lenses around the world. This week-long project organized by Fotoprojek, a citizen initiative, aims to introduce a subjective point of view from the front lines of the conflict. 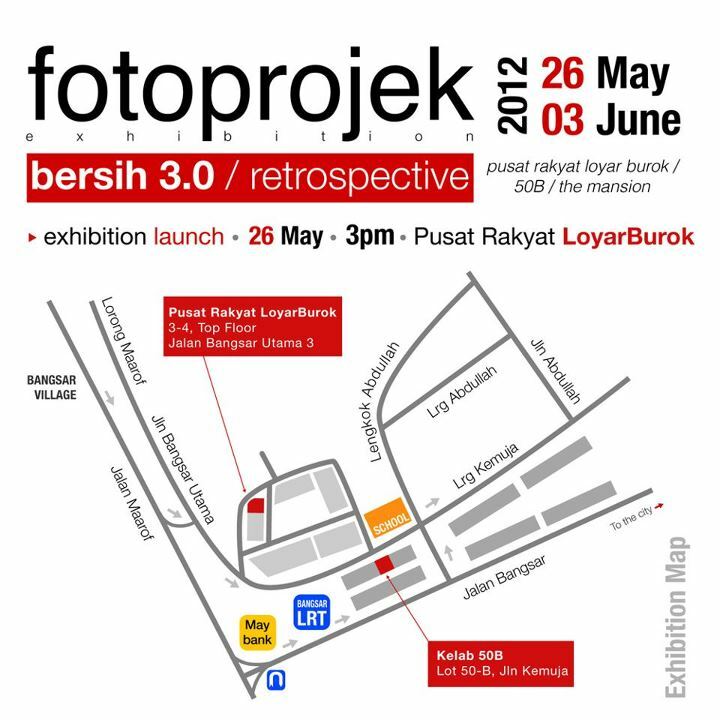 The exhibition will showcase over 250 photos by Malaysian contributors from around the world and curated by a panel organized by Fotoprojek. Submissions were open to professionals and amateurs. This non-partisan photography project aims at presenting the events of the day without bias with the objective of allowing the public decide for themselves on the contents of the photo. 1) What are your thoughts on exhibitions versus online albums? Would you ride the wave and publish pictures soon after, when people are high on the buzz, or wait? I think online albums are great for reviewing work, to know what is out there and get a lot of information in a short span of time, all at one place. However a print exhibition is always more exciting to me – for one the prints are much larger and something about a photograph being printed out makes it a lot more “convincing”. A digital image feels too fleeting and flimsy. Also, I feel that at gallery exhibitions, what is interesting is how the images react to the space. You will see that the images curated for this show have been carefully selected for its photographic value but also arranged in a way that makes sense to the space its hanging in. In this way the image takes on a new life and meaning when in a gallery space by virtue of how it is displayed there. And as curators that is what comes to mind much of the time – about the room and what it feels like, the light quality in the spaces and the mood it conveys, the sizes of the images, how much or little to put into a room, the subject matter, etc. Therefore, it’s my feeling that while it’s great that photos are up on the Internet the instance something happens, its entirely something else to look at work that has been carefully curated for a hanging exhibition. The element of retrospect and hindsight also plays a greater part in making these exhibitions a more worthwhile thing to visit. 2) Does the ease of sharing pictures that are already online, override the curated exhibition in terms of getting the message across? As I mentioned above, the hanging exhibition to me is a very unique experience to see the work in its physical form and in a very special context. I also think that the other charm of the gallery exhibition is that its a fleeting “performance”. Its there for a week or two, and then its gone – never to be seen in that context again. So in this way gallery exhibits are really a unique experience. Online galleries are great as they have the potential to reach a larger audience and have a much longer presence in the social sphere as they dont come down after two weeks. Plus the ability for folks to repost links, etc make it available to a wider audience. However its message is often fleeting and very rushed. How often we jump from one browser window to another in just seconds. The ability to hold the viewers attention and promote critical thinking in online albums is very weak compared to a hanging exhibition. 3) Knowing that some authorities do not understand the role of media in conflict, would you photograph conflict defensively, or get in on the action no matter what? I dont think that the incidences between the authorities and media stems from a lack of understanding or misunderstanding. The media has been functioning in Malaysia for a very long time and have had a pretty cordial existence with the authorities. However what happened on that day between the media and authorities was an extraordinary case. In photographing in areas where there is a hostile reaction to the presence of photographers, it’s a tricky balance because you cant hold back too much or you wouldn’t be as effective as you’d like to be, and on the other hand, if you take too many risks and get caught, you may lose all your work. So its a fine line. I think experience, forward planning and knowing your exit routes make a lot of sense. 4) How does one curate an event where each photographer gets very different pictures and a very different story and experience? Good question. Contrary to your question, I think most of the images we’ve seen tend to have very similar themes, shots and choices of telling a story. So for us as curators, the challenge was really finding the unique stories from the submissions and curated them in a way that would be fair to what happened on the ground. You see, this exhibition isnt about putting forward any agenda, neither is it a rebuttal to anything. Its plainly a re-look at the events of the day through the eyes of different photographers and trying to give a larger view of what happened. The uniqueness of this exhibition really lies in how the photographs are put together. The prime idea we wanted to achieve as curators is to show the work in a new way – otherwise there wouldn’t be any point in looking at it because you can see it all online, right? So the photographs almost are a poetic walk through the experiences once again. The whole idea of this exhibition is to encourage people to abandon the ideas put forth by politics and the media and come to their own conclusions, by themselves, for themselves. The beauty about photography is in its subjectivity and ambiguity. Through the curating process we hope to make the audience unlearn and rediscover what happened on their own. I would like to extend a very very special thanks to the dedicated photographers around the world who contributed to this amazing exhibition. Without their dedication in documenting the event and wanting to be part of this by sending in and editing their work, this exhibition would have never been possible. On behalf of the curating team, I’d like to express what an honour it’s been for us to work with you and your exceptional images. You guys and girls rule! I’ll be dropping by on another day, probably Sunday the 27th of May 2012. This entry was posted in Pictures on May 23, 2012 by 2konbla.